Lions And Tigers And Chicken Sandwiches– Oh, My! Creak, creeeeeak! That’s me trying to sneak into my own blog. Note to self: get some oil for that door! I just completed a big project. I need a break from it, however, so– with your kind permission– I’ll talk about something else: namely, a fun assignment I had last fall. It was for Chick-fil-A, the restaurant chain famous for its chicken sandwiches. Chick-fil-A sponsors a kickoff game on the opening weekend of the American college football season. The game is played at the Georgia Dome in Atlanta. The 2015 Kickoff Game pitted the Louisville Cardinals against the Auburn Tigers. As you may have guessed, the team mascot for the Louisville Cardinals is a cardinal, and the mascot for the Auburn Tigers is a tiger. Why the parachute? 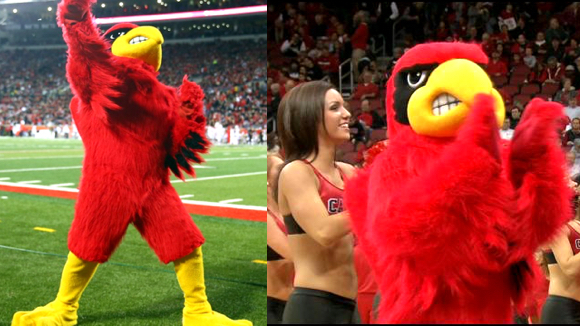 Believe it or not, Louie skydives down onto the field before each Louisville home game. A soldier from Alabama was the sole Confederate survivor of The Battle of the Wilderness (1864). Stumbling across the battlefield, he came across a wounded young eagle. The bird was named Anvre, and was cared for and nursed back to health by the soldier. Several years later the soldier, a former Auburn student, returned to college as a faculty member, bringing the bird with him. For years both were a familiar sight on campus and at events. On the day of Auburn’s first football game in 1892 against the University of Georgia, the aged eagle broke away from his master during the game and began to circle the field, exciting the fans. But at the end of the game, with Auburn victorious, the eagle fell to the ground and died. 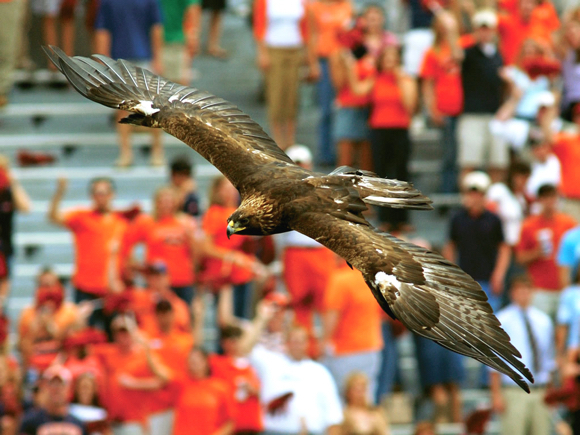 Beginning in 1930, and continuously since 1960, War Eagle has flown over Auburn’s football field before every home game. The current War Eagle is actually War Eagle VII (2006-present). Unlike Louie, he doesn’t need a parachute. Here’s the illustration again. It’s a good example of a company using social media and fun unique custom illustration to promote a major event. BTW: Auburn won, 31-24. Do you use social media to promote company-sponsored events? Has anyone ever worked as a team mascot? What’s it like in there?? Are there any Confederate war veterans out there who can confirm the War Eagle story?? ← O Holy Night… Hey, Was That A Camera Flash?? Wow! A parachuting mascot?! Now that’s just impressive. Hi, Lily! Great to see you, hope you’re surviving that always challenging UK winter. I have to admit I share your fantasy about being Mascot For A Day. I suspect it’s a hot and sweaty job, but the fun factor does seem off the scale. The Love Factor, too– everybody loves a big fuzzy mascot– half the gig is probably posing with people for pictures! Way back in college, Chic-fil-A was the GO TO spot – yummmm and now I’m hungry at 9 am and I’ve already eaten all my Valentine’s candy – darn you, funny man! Congrats on the clever campaign! 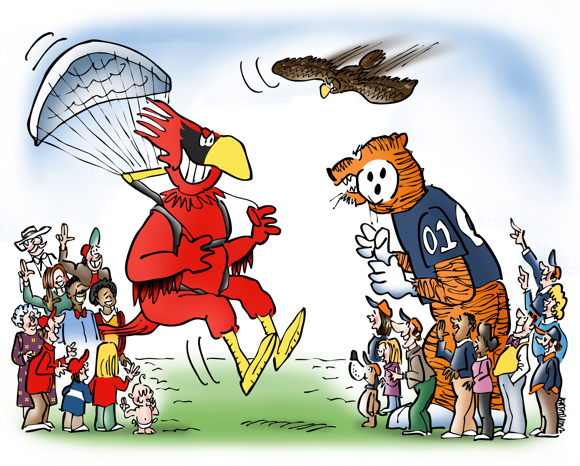 Louie the Cardinal and the War Eagle certainly know how to get the fans excited. But I think I’d pass on parachuting in. 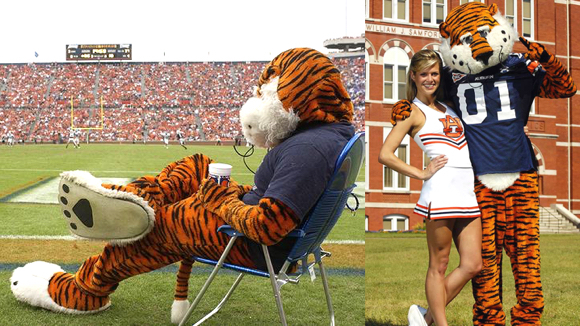 Does Abie the Tiger have any perks to his job other than hanging with the cute cheerleaders? Chick-fil-A picked a winner when they asked you to do the illustrations for the kickoff game. Excellent work as usual, Mark, and I love the back stories. Your question about Aubie the Tiger having any special perks prompted me to do some googling. Auburn University has a special page about him, detailing his history. Doesn’t mention any perks, but he does have his own staff, including directors of scheduling, fundraising and publicity! He was also the first mascot inducted into the Mascot Hall of Fame— I didn’t even know there was a Mascot Hall of Fame!! So I guess that’s a homing eagle, it knows where to go and come back? You know being a blogger and illustrator makes one sees things no one would think of highlighting! Not sure I’m an especially bright bulb for highlighting War Eagle. I was told he was an essential part of the illustration, which prompted me to do some research on him. He has a colorful history, to say the least– I guess that’s usually the case when so much of one’s history is legend!! Chick-fil-A? You had Chick-fil-A as an account? WOW!!!!!! That’s super! Also – Congrats for finishing your big project, Mark! Taking a break to come here is a lovely way to celebrate/escape. A tropical beach might a little bit more fun, but then we couldn’t get to see you!